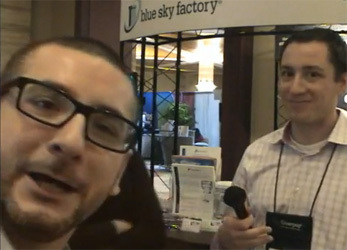 DJ Waldow and Nikki Schiavone of Blue Sky Factory take over mic and camera from our intrepid reporter, Jeff Ginsberg @ MarketingSherpa’s 2010 Email Summit in Miami. If DJ and Nikki ever wanted to change careers (and they don’t cuz they love email) they could probably do pretty well co-hosting a morning radio show. At one point Nikki decides DJ isn’t doing the interview right and a short microphone skirmish ensues. Nikki takes over the interviewing and puts DJ on the hot seat. DJ and Nikki talk about what they do, what Blue Sky Factory does and what they enjoyed at the summit. Should sales people be blogging for your brand? Nikki blogs for Blue Sky Factory and makes a great point that blogging about your brand helps you know it better as a sales person and helps you sell it. 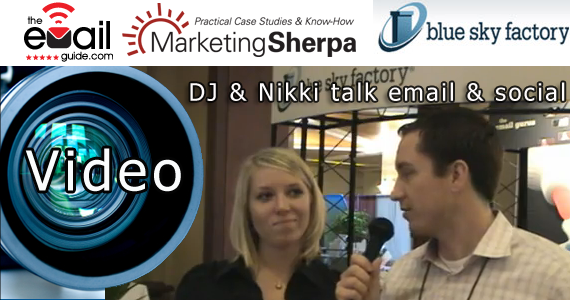 Jeff Ginsberg joins the discussion and prompts Nikki and DJ to share some of their insight and advice with those new to email marketing. 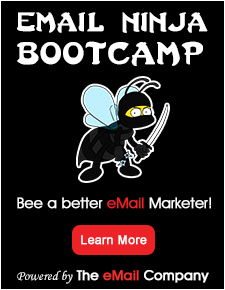 From Nikki’s POV, email is the digital glue which holds everything together for a marketing plan, but you have integrate social marketing into your strategy as well. It’s clear from DJ’s comments that sharing on social and blogs means sharing part of yourself. For some that comes easy and for others, well, they have to work at it. Obviously DJ has a special talent and is fearless when it comes to making those connections and building those relationships. DJ points out the one big problem with being involved in social media (which I can certainly relate to), it’s hard to turn it off. You get so involved with the community online that you just can’t step out of the virtual without making a conscious effort to do so. In other words, no tweeting during dinner or at the kid’s piano recital! View more great videos here! Takeaway: Email is the digital glue which holds everything together for a marketing plan, but you have integrate social marketing into your strategy as well. *On further review I released Greg was saying “cut” and not “hi” so I updated the post. Doh.